Compliments can be a bit awkward, they can feel a bit embarrassing to receive or we might feel a bit a shy in telling people the things we really love or admire about them. Deep down though, it’s lovely to know all the positive things people think about us, or to share kind words with others. In a world of online trolls and where the kindness of strangers can get a little lost in the sea of upsetting news headlines, and the chaos day to day life, an uplifting comment or a note of praise can go a long way! With that in mind I created this little tear sheet, a small rainbow of positivity to brighten up the day of your friends and colleagues and maybe even some strangers too. Stick them up anywhere people will see them and take the compliment you need to hear - or tear off a little strip to pass on to someone else. Download your free A4 sheet here. Pregnant, sick and altogether feeling a bit rubbish I jumped at the chance when the lovely Vicky and Chris at Bethnal and Bec offered me a night in their scenic Bethnal retreat. 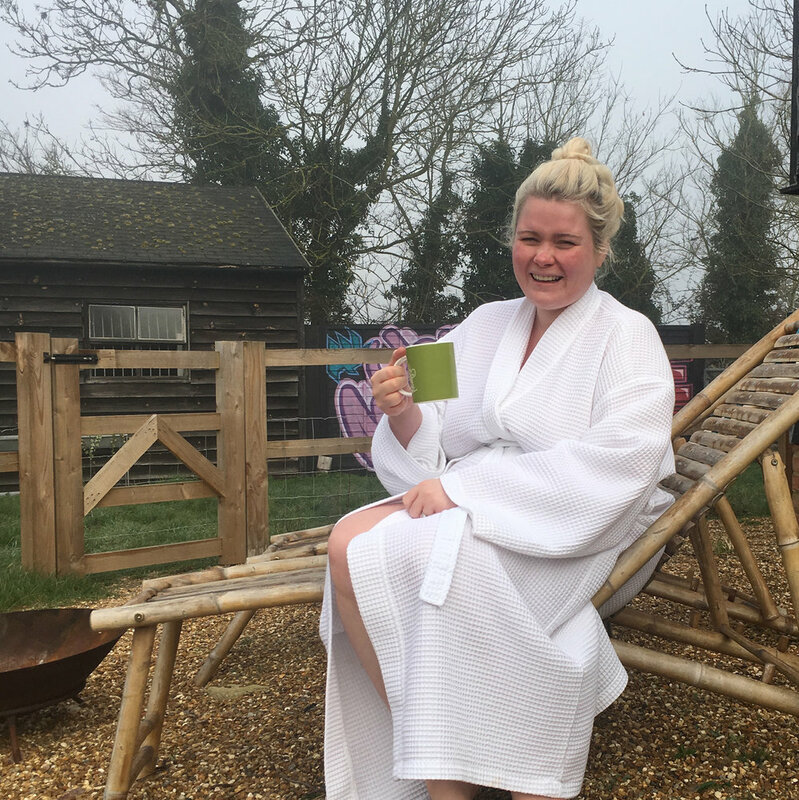 Based in the pretty village of Cottered in Hertfordshire this little haven is super easy to get to - for us, only 35 minutes along the A1 - and for an added splash of romance, just a stone’s throw from where Jon and I had our wedding reception. These two newly built retreats are secluded spots of luxury equipped with all mod-cons and every detail, from the well-stocked kitchen to the perfectly plumped pillows, has been thought of. If you’ve got furbabies it’s also worth noting that they are dog friendly and provide a pantry of pup treats too! Whilst we don’t have dogs, we do have an almost four year old and a 19 month old who we have never left overnight before - so to have a full evening to ourselves was a proper treat. We arrived at Bethnal in the early evening and found the hot tub on waiting for us and a well stocked kitchen with plenty of (alcoholic and more pregnancy friendly) drinks and nibbles to enjoy - all the more appealing knowing we didn’t have to share with two snack-hungry children! I’m a worrier, so chose not to jump in the hot tub whilst preggers (I’m going to save that for a post-baby return trip when I can enjoy the scenic views and a glass of fizz) and instead got into my PJs and rustled up some homemade pizzas using the fresh dough and toppings we had pre-ordered and settling in by the wood-burner for some proper relaxation. Like a lot of tired parents, we relished the chance of an early night and soon jumped into the super comfy bed and snuggled up to enjoy re-runs of Friends on Netflix. Bliss! Checkout isn’t until 11am so we had plenty of time the next morning to ease into the day and squeeze in every last drop of relaxation we could. It was a hard choice between starting the day with a bath in the gorgeously dramatic roll top or heading to the bathroom for a lengthy spell under the walk-in rainforest shower but the shower won. A hot, uninterrupted shower is the stuff of my mum-dreams! Tempting as it could have been to have stayed there all morning we instead cooked up a fried breakfast using the basket of locally-sourced goodies included in the stay (delicious!) and enjoyed a coffee in the private garden, overlooking the fields and relishing in a bit of morning peace and quiet. 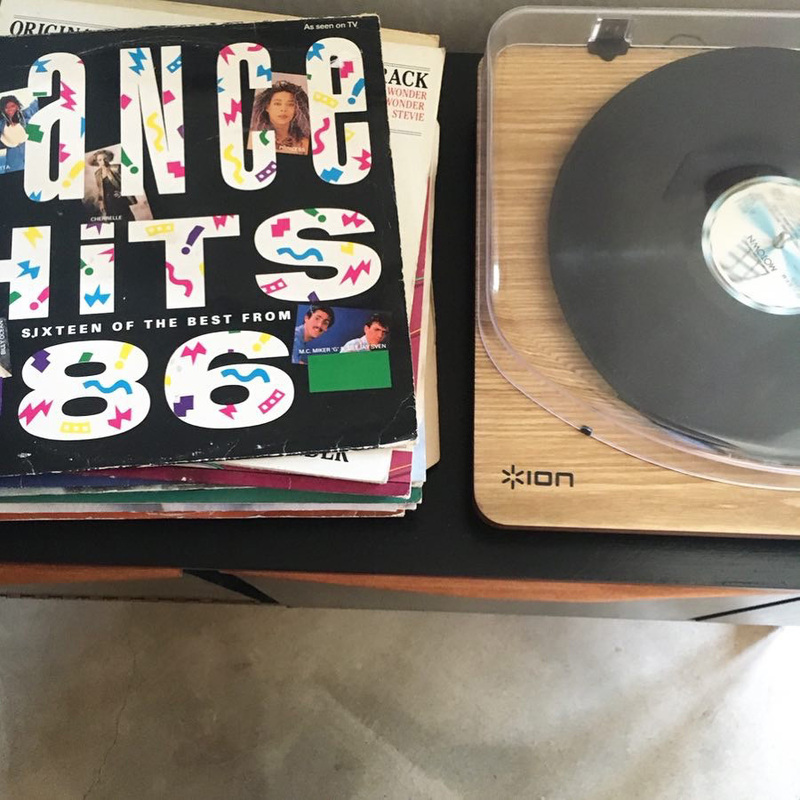 We packed our bags listening to 80s songs on the record player and noted how much of a difference a short break can make. A few hours of rest and relaxation provided the perfect pick-me-up after some really tough weeks. And whilst we didn’t go wild or do anything too fancy, the time spent together, reconnecting and enjoying each other’s company in a little bubble of comfort and luxury was perfect. I can’t wait to go back! Valid for bookings made up to 21st March 2019. Cannot be used in conjunction with any other offer. I love bath bombs and scented candles as much as the next person. Throw a spa day my way and I’m in my element. Whilst these things totally do count as self-care, they’re very much the cherry-on-the-icing of the looking-after-yourself cake. Easy to forget in our glamourised social media worlds of #selfcare. In reality, the most mundane, boring, daily activities can be our biggest acts of self-care. The solid foundations that allow us to nurture and appreciate our mental well-being. Of course some days are easier than others, even when it comes to the most basic tasks. Depending on our mental and physical health, the things we have going on at home or work, finances, or time constraints, some things on this seemingly simple list may even feel impossible. Other days we could sail through them all (and even have time to post our facemask selfies on Instagram too). This is a self-care checklist for everyday, something to aim towards to ensure our infrastructure is at its strongest. Luxuriate in the bath with your fanciest bubbles or grab a wet wipe for a quick freshen up. Taking care of ourselves, investing in our bodies in even this small way, is a super act of self-care. I’m a huge fan of an evening shower to wash away the day’s ups and downs and to take a few minutes to myself once the kids are in bed - clean and calm for the win! Stretch in your chair. Do a lap of the garden. Try yoga or pilates. Run, swim or head to the gym. Find a way to move that is manageable and that you enjoy. We all know the benefits of exercise, but even a small amount of movement can shake off the cobwebs and improve your mindset. There are some great 5 minute yoga stretches on YouTube if you need a speedy solution (search ‘yoga with adriene’). Practice self-care by keeping some healthy snacks at hand, choose mood-boosting foods, plan where you can, and try your best to eat a balanced diet. Left to my own devices my three main food groups would be chocolate, toast and coffee… but I know how much better I feel when I make the effort to eat proper, nutritional meals. Batch cooking, subscription boxes or sharing the responsibility of meal making could all be great ways to eat a little better if you’re stuck in a rut. Not coffee. Aim to keep yourself hydrated with lots of water, grab yourself some flavourings or squash if you struggle to get enough H2O. If you’re feeling super fancy, TK Maxx always stock those clever bottles that you can use for fruit infusions. Or my favourite; sparkling water - not because I’m posh, but because my Diet Coke addiction means I find anything more palatable if it has a little fizz! Treat yourself like your favourite houseplant and keep your water levels topped up to keep you bright and blooming. Rest is so important. I’m so strict with my kids, early bedtimes, routine nap times. I’ve seen the effects of sleep deprivation and how emotional and crabby they become. Do I always apply this same care to myself? Nope. Sleeping can sometimes be easier said than done, but a good routine ~ no phones in the bedroom, reading a book, no caffeine in the afternoon, putting ourselves to bed at a sensible time ~ is the adult equivalent of being tucked in and read a bedtime story. These acts of self-care give us the best chance at relaxing and grabbing those all important ZZZZs. If you can, take naps too. Recognise when you need to recharge and allow yourself the time to recuperate and for your body to recover. Disclaimer: I know how kids are pre-programmed to be slightly nocturnal but if you can get some good sleep habits in place you might find yourself a little more rested even faced with the tiny night owls we call children! Keep this list in mind and tick off what you can, when you can. There’s still room for spa days but the simple self-care matters too. This week at nursery drop-off, arms full of bags and baby, cajoling my three year old to keep pace I made a joke about our plan to one day have a third child. The person I said it to replied …suggesting we wait until Matilda is different. (She used the term ‘less fickle’ though think this was an emergency end to an un-thought-through sentence). I told her (and Matilda, who was in earshot) that we wouldn’t have her any other way - but it made me consider how important this message really is. My beautiful girl is smart, fiery and every red-headed stereotype you can imagine. She does her own thing, she questions everything and answers back. Boundary pushing and testing limits is her pastime. She is empathetic and seeks out the quieter, less confident children and includes them in play. Her keen sense of justice and what is fair makes her quick to speak up against what she thinks is wrong. She is imaginative, strong-willed and huge-hearted. At three years old, she is everything I could want her to be, and all the things that will make her a force to be reckoned with as she grows into a woman. So, as full on as it can be parenting such a tiny whirlwind, I hope she never changes. 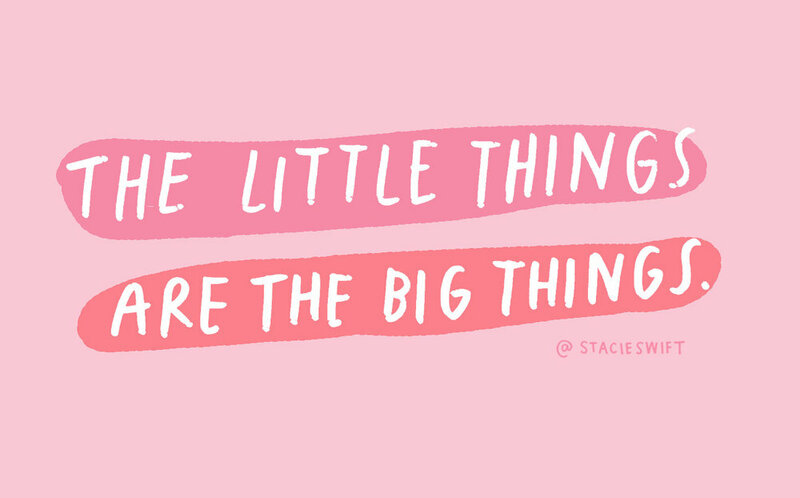 In life, some people might not appreciate your full ‘you-ness’; asking you to be a little different, a little less vocal, make things a bit easier for them, to tone down your full, dazzling and magnificent self. Don’t listen to those people. Continue to be wonderfully you, you’re amazing, awesome and perfectly imperfect just the way you are. Recently I was able to show my artwork at a local gallery space in a lovely community hub, I was so excited and so pleased to have my work reach a new audience, and proud to see my illustrations on display - but part of me was also really nervous and the insecurities came thick and fast. What if nobody comes along? What if it’s not well received? What if people think I don’t have the credentials to discuss mental well-being? I am a fraud and everyone’s will find out that I don’t deserve this attention / praise / exposure! As sod’s law would have it, the same day of my gallery launch, I received a snarky comment in my Instagram DMs, derisive of my artwork and questioning my integrity regarding promoting positive mental health. Instead of writing it off as insignificant, the words snuck into my brain and took root. The negative thoughts sprouting and growing. I didn’t feel confident at the gallery launch despite a great show of support and healthy turn out. I was anxious afterwards and ultimately a bit down in the dumps for the rest of the week as imposter syndrome did it’s best to rattle me. It was only when I discussed my thoughts aloud with Jon that I was able to reframe the negativity. My illustrations are shown because they are good enough to display. People are interested by and supportive of my work and the themes they cover. Everything I illustrate comes from a genuine place of lived experience or the experiences of the people closest to me. I deserve the positivity that comes my way - it’s not luck that determines any success, I’ve worked hard for it! It also helped when I looked at the facts, that one not-so-great message was a single DM in a sea of positivity. Lots of people are lovely enough to take time to message me to let me know how my illustrations make a difference to their days; how they help through the hard times and brighten up their feeds. Jon suggested I print out all the lovely comments and keep them somewhere I can see them for the days I don’t believe in myself enough and I think I’ll do just that. Look at the facts. Write them down, say them aloud. Seek reassurance from people you trust. Keep a record of praise, positivity and things you’ve done well. This isn’t a foolproof plan for eliminating self-doubt but it’s a good start for helping focus when the negative thoughts creep in! TO DO: ASK FOR HELP. There are plenty of things I'm not very good at; swimming, keeping plants alive, going to bed early despite always moaning that I am tired... But the thing I am probably worst at is asking for help. The other week I had a huge amount of work to complete for a deadline, was hosting a garden party for friends that evening, had Arthur at home still on sleep strike and still had all the usual day to day things to contend with. And I just could not do it all. It was physically impossible. Usually I'll struggle and juggle and find a way to make things happen, but this time around I waved my white flag and called for back up. And it was the best thing I could have done. Asking for help also means admitting you can't do it all. I really don't like to admit defeat, or give the impression that I'm not coping. But how silly is that?! I've never thought less of anyone else for asking for a helping hand - and calling in the cavalry is sometimes the only way to do everything, or to keep from running yourself into the ground. Sometimes it feels as though you should do it all. Other people seem to have it all together, you usually can manage the eleventy billion things you've got going on, it feels as though it's your job to get stuff done... but we all need support sometimes. No (wo)man is an island and there's only so much one person can do alone. Added to this, there's the worry of working yourself up to ask... only for someone to say no. And then you'll wish you hadn't asked and you feel a bit vulnerable and annoyed to have put yourself out there. But actually, you've not lost anything. And if someone isn't there to help you when you really need it it's a good time to whack in some new boundaries and reconsider your Christmas card list! Most people do really love to help - and in the same way you'd hate to see your loved ones struggling, your friends and family are likely to be glad to know they could be there to lighten the load. It makes me happy to know I've been able to help those around me so letting people in and giving them the opportunity to return the favour can only be a positive thing. In asking for help I managed to get my work done (and to a better standard), the baby got lots of cuddles instead of having to put up with a frazzled, spread-too-thin mum, and I managed to get the Pimms made and the bunting up with 5 minutes to spare before my guests arrived. Sobbing into your pillow at 4am is a sure sign that things aren't quite as tip-top as you'd like them to be. I found myself in this snivelly, sorry state a few nights ago. So anyway, there I was - multitasking; boobing the baby, snotting into the pillowcase, running through my mental to-do list. Torturing myself with the myriad of tasks I had to get through and wondering where I was going to find the energy to do them all when I didn't have the oomph to form complete sentences ...and it dawned on me that what I probably needed was a break. The constant pressure to do everything, put everyone else first, to never disappoint or let anyone down is just not sustainable. I'm trying to be the best mum, wife, friend, illustrator, instagrammer... trying to give everyone 100% all the time and my cup was not only empty, it was drained of every last drop. So I let myself rest. And the world didn't end. I accepted help. Instead of us all starting the day together, my husband sorted the kids out so I could sleep a little longer. I stepped away from my phone - and the notifications demanding my time and attention - and let the messages, emails and instagram wait. Instead of breaking myself to get orders sent, I advised of a short delay and accepted that I am only one person with no Amazon-esque workforce to get it all done. I took a nap instead of pouring that extra cup of coffee. A few days of self-care SOS much needed to re-balance and reboot me.